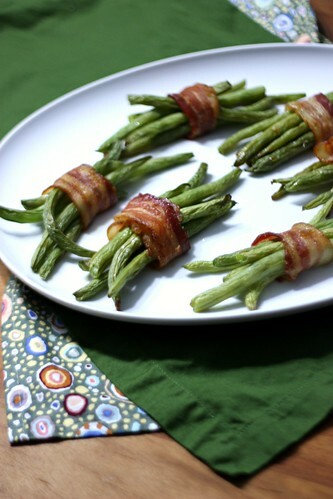 Green Bean Bundles with Bacon and Brown Sugar – Elly Says Opa! Thanksgiving is 2.5 weeks away and I don’t understand how that’s possible. Weren’t we just talking about the fourth of July and seeing kids’ first day of school pictures on Facebook? Plus, I’m pretty sure everyone has PTSD from last winter’s awful weather. So here we sit with bated breath, unsure whether we should be happy the holidays are approaching or terrified of the winter that might come along with them. Ready or not, they’re coming. Tis the season where you can bribe your kid to be good because Santa is watching. We’re headed to my inlaws’ for Thanksgiving, so I’m off the hook for cooking, but as I made these, I thought they’d make a great Thanksgiving side. I am certainly no stranger to cooking green beans with bacon (thank goodness) but this method makes for a nicer presentation and is also pretty easy to prep. Although the original recipe calls for frying the bacon until it is “just beginning to brown around the edges but still very underdone” I really see no reason you can’t leave the bacon raw before baking. I had the bacon on the stove for such a short amount of time that I basically just warmed it, so next time I’ll probably just skip that step entirely (the benefit, though, was that we had these with roasted pork tenderloin and I was able to sear the tenderloin in the bacon fat :-D). And while I’m at skipping steps, I honestly don’t think you need to blanch the beans either. Don’t worry – if you ever need someone to condone your step-skipping or laziness, I am here for you because I am you. Preheat oven to 350 and line a large baking sheet (or two) with parchment paper. Cook the bacon slices in a large, nonstick skillet over medium heat until just beginning to brown around the edges but still very underdone and pliable, 3-4 minutes (see note above). Transfer to a paper towel-lined plate to cool, and then cut each piece in half. Divide the green beans into equal-sized bunches (about 6 beans each) and gather each pile into a neat bunch, wrapping the bacon around the center to keep them together. Place on the baking sheet with the loose ends of the bacon on the bottom. Mix together the butter, salt, and garlic powder (I like to melt the butter in a small measuring cup in the microwave, and then add the other ingredients – makes for easy and even drizzling, too). Sprinkle the green beans with the brown sugar and drizzle with the butter mixture. Roast for about 25 minutes, until bacon is cooked through. Let stand for a few minutes before transferring to a platter and serving.